The site has 26 acres of flat parkland; Ample car parking space; Permanent tarmac roads around the park; 3 permanent toilet blocks; Disabled toilet facilities; For disabled campers we have a limited amount of electricity hook ups; Mains water supply; Waste disposal facilities. Camping will be allocated on arrival but we would be grateful if you could indicate on the booking form the amount of people staying; for what period; and whether you have a tent, caravan or camper van please? 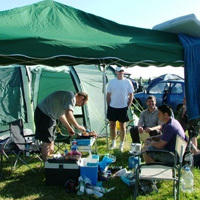 A camping fee of £5 per tent, camper or caravan will be applied and collected on site during the Conference.